The Owen Collection started in 1988 with the restoration of the 1973 Penton which I had stored away for years after being retired from service in 1974. As time has passed, I have added two or three bikes per year either fully restored by myself or purchased in restored condition. In some cases the bikes were purchased new in the crate and became very special additions to the collection. Approximately half of the 70 bikes were restored by myself and the remainder by some of the foremost restoration experts in the country. I do spend countless hours researching each of the bikes, even those restored by others to be sure they are restored as accurately as possible. I try not to over restore the bikes, but it is sometimes difficult to replicate the crude paint and dull chrome work that was typical of the period. The goal of this collection is to provide other amateur restorers a source for reference in their restoration projects. 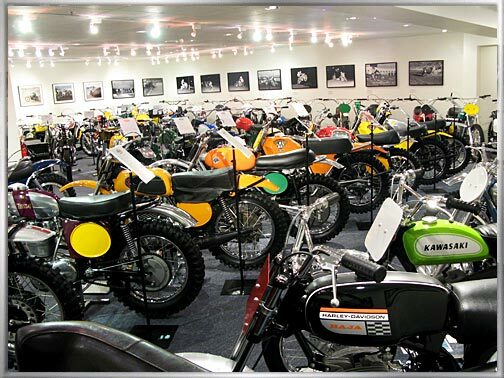 It is my hope that every bike in the collection is of the highest caliber for that particular brand and model, from the mechanicals right down to the tires. Although some tires are incorrect in the photos, all of the bikes are fitted with the exact brand, size, and model of the tire that came on the bike when originally built prior to placement in the museum. Incidentally, all bikes in the museum are mounted on OC Power Products Stands. 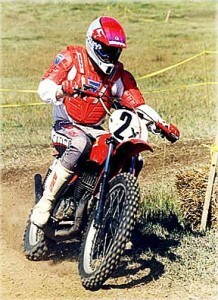 One emphasis of the collection is that of first year of issue motocross machines. Yamaha, AJS, Honda, Suzuki, Bultaco and Kawasaki all have first year representation. I rode in the late 60’s and began my racing career in 1970 at age 13 aboard a Penton 100 Berkshire. I remember looking down the starting line and seeing all of the brands you see in this collection. I rode through the mid 70’s as a young pro who had some success, but couldnt make a living at racing. I am proud, however, to say that I was able to live the life most young guys dream of. I raced at all of the great tracks and even the Superbowl of Motocross in 1974 and 1975 at the LA Coliseum. I retired in 1976 and came back in 1988 as a vintage racer riding CZs and Elsinores.